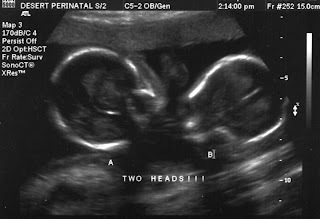 After visions of triplets floating through my head (and one too many jokes from my loving, yet slightly twisted friends and family) I pretty much demanded an ultrasound the second the doctor walked into the room. Haha! Gotcha! This is a flashback from the twins. (Yay! Just one!) That's correct, it was the sigh of relief heard around the world. OH my gosh! You totally got me!! :) hehe. YAY for one!! You got me too! I was like- whoa!!!! again twins? but yeah for one! you can handle that- after twins one will be a walk in the park;) congrats!!!!!! Aww! 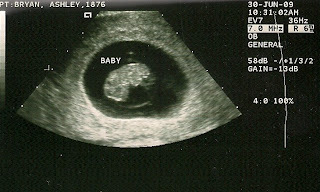 Look at your little bean!! :) I hope you're back to feeling more like yourself soon.